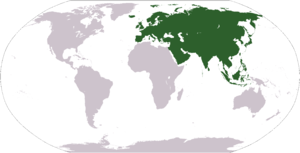 Eurasia is the combined landmass of the continents of Europe and Asia in the northern part of the Earth. Eurasia is made of Europe and Asia, which are on the same tectonic plate and do not have a sea between them. The word is made by adding "Eur" (from Europe) to "Asia" to make "Eurasia". Some geographers say it's all just one continent, because unlike the Americas or Africa, Europe and Asia are not divided by sea. The Ancient Greeks divided the world they knew into Europe, Asia and Africa. Knowing little of the land north of the Black Sea, they took that and the Sea of Marmara as dividing Europe from Asia. Since then, people have been talking about Asia and Europe as two continents so it is now a tradition. Some other continents are not completely divided by sea and are joined together and by a thin strip of land (called an isthmus) like North America and South America. However, Europe and Asia are not divided by sea at all. Sometimes Eurasia is divided into West Eurasia and East Eurasia. West Eurasia is Europe and the Middle East. Historians sometimes add North Africa to West Eurasia because the Sahara Desert divides North Africa from the other parts of Africa and it is as difficult to cross as a sea.